We’re definitely going to reintroduce Cordylines to our garden again. Gosh, we didn’t realize how gorgeous they can be until we saw this striking variegated pink/maroon beauty at Felda Residence Hot Springs recently! Ti plants are such popular ornamental foliage plants, grown for their spectacular colours and leaf shapes. They are highly seek by gardeners and landscapers alike for their intense and vivid colours, especially the fluorescent pinks, maroon and reds that sparkle amidst a sea of greens or in a mix-crowd! In our country, they’re seen almost everywhere, dotting the scenery and widely used by landscapers to decorate roundabouts, highways, road-dividers, public places and elsewhere. If you desire a tropical setting, Hawaiian Ti is surely one that you may want to consider planting! There are so many cultivars with gorgeous color combinations to choose from. 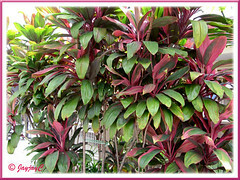 Common Name: Hawaiian Ti, Good Luck Plant/Tree, Ti Plant/Tree. 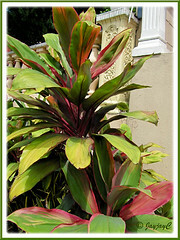 Its name: Cordyline is derived from the Greek ‘kordyle’, meaning club that refers to the thickened root. Ti, should be correctly pronounced as ‘tea’, though some prefer to rhyme it with ‘tie’ which is incorrect. Features: Cordyline terminalis is one of the approximately 20 species of the genus, Cordyline which was earlier classified as Dracaena rather than Cordyline. 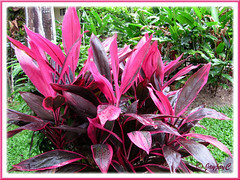 Being among the most colourful foliage plants, it is the most popular species of the genus for indoor potted plants. Ti Plant is an evergreen tropical shrub that can reach up to 3 meters tall, though generally seen about 1-1.5m high in cultivated plants. It has a fairly slow to medium growth rate and is often confused with Dracaena, but these two plants can be easily differentiated by the way their foliage hug the stem. It has an upright growth habit, with slender yet strong and erect trunk in grey to brown that are covered with leaf scars as the lower leaves wither with age. Such that the trunk eventually becomes leggy and top-heavy with just tuffs of foliage at the top. But when cut back, the usually unbranched stem will sprout new shoots at the point where it’s severed to eventually present a shrubbier plant with impressive and spectacular foliage. Ti Plant does sometimes throw out suckers from the enlarged club-like rhizomes to form a clump. Depending on the various hybrids and cultivars, the leaves may be glossy and come in many shapes and sizes. Leaves can be 30-60 cm long and 10-15 cm wide, shaped oblong-lanceolate, elliptic-lanceolate or narrowly oblong with 10-30 cm petioles. But it’s the awesome colours and marvelous variegation of the foliage that captures avid admiration. Besides the original leaf colour in deep green, it’s now extensive, ranging from various hues of green, purple, maroon, rose, pink, orange, yellow to white, and wonderfully variegated in many colour combination. Ti Plant does flower though seldom seen. Flowers are insignificant, white to purplish and clustered in loose panicles that gradually develop into red fruits. 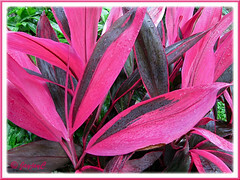 Update Nov 25 2011: How wonderful to have chanced upon a flowering Cordyline terminalis at a garden center recently and be able to display it here. 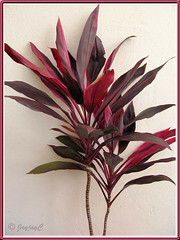 Culture (Care): Cordyline terminalis (Ti Plant) is quite an easy foliage plant to grow and maintain. Light, temperature and fertilizer levels appear to affect the intensity of its kaleidoscopic colors on the foliage. Light: Bright light or nearly full sun (not direct or scorching sunshine) is best to maintain strong foliage coloration and vigorous growth. Tolerates low-light to shade, but leaf variegation can be affected and become a tad dull due to reduction in light intensity. Constant warm conditions is beneficial. Moisture: Water moderately and regularly, keeping it evenly moist. At lower temperatures, water sparingly and allow soil surface to dry slightly between watering. It enjoys high humidity, so mist the plant regularly or stand potted houseplant on a saucer of pebbles filled with water to just below the base of the pot to prevent browning of leaf margins caused by dry air. And, to further maintain humidity for houseplants, keep the leaves dust-free by wiping them with a moist cloth. Soil: Fairly fertile and well-drained soil with good aeration and water-holding capacity. A soil pH level of 6.5 is preferred. Others: Remove spent or burnt leaves to keep tidy. If older plants become leggy, hard-prune the main stem to within 10 cm from base to revitalize the plant and promote bushiness. You can then use the severed stem and cut into shorter 10-cm lengths for propagation. It is recommended that potted plants be repotted every two to three years. Or if it had been repotted to its maximum pot size, topdress it annually by removing and replacing the top 5-7.6 cm of soil. Feed once monthly during the growing season, but sparingly during winter, with a general liquid houseplant fertilizer at reduced strength, on the soil but never on the foliage. Try to avoid these conditions: dry air, excess fluoride in the water, low light levels and low temperatures will cause browning of the leaf tips and margin, while direct sunshine causes scorching and brown patches on the leaves. Cordylines are generally free from pests, but do check for mealybugs, scales and spider mites that may infest it occasionally. For subtropical regions: Hardiness: USDA Zone 10-11. Ti Plant should not be subjected to temperatures below 13 degrees C. Water and feed sparingly during winter. Visit Dave’s Garden to read growers’ comments about Hawaiian Ti Plant, especially winter care and those outside the hardiness area who confirmed that plants that die back to the ground do come back after a frost or freeze. Propagation: By seeds, though not easily available on cultivated plants. The easiest method of propagation for Cordyline terminalis (Ti Plant) is from tip cuttings or stem cuttings called ‘logs’ that can be started in the soil or in water. 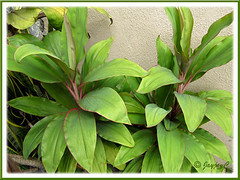 Read here on how to propagate Ti Plants. Usage: An attractive and colourful ornamental foliage plant, that is great in containers or above ground planter, indoors as houseplants or located at the porch, deck, patio and others, outdoors. Excellent too when ground-grown as a shrubby plant in gardens as an accent or striking single specimen, and even as lovely in a mixed planting in garden beds or borders. Differently coloured hybrids or varieties of Cordyline, when grouped and planted together will produce a fabulous kaleidoscope of colours to brighten up any area. Ti Plants, if properly pruned, can be created into wonderful shrubs as screens or hedges. Cordyline terminalis are such magnificent plants, ideal for landscaping, and definitely a shrub that add interest and marvelous contrast, making an impact wherever they’re planted. Some varieties of Ti Plant are also used in floral arrangements. In some regions, native peoples use the Ti Plant’s starchy rhizomes for food or simply as famine food and to produce liquor while the leaves are used for cooking and fashioned into Hawaiian hula skirts. The Hawaiians believe that Ti Plants bring good fortune to their owners, hence called, Good Luck Plant, Miracle Plant or Trees of Kings, to name a few. Ti Plant has many medicinal uses traditionally too. Its leaves are used to relieve fever, headache, soothe sore back muscles and as a decongestant. Read more at National Tropical Botanical Garden (NTBG) on the medicinal uses and indigenous practices/usage of Cordyline fruiticosa or Ti Plant. 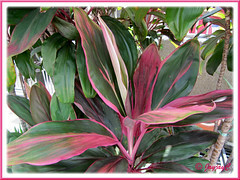 Enjoy some more pictures of Cordyline terminalis (Hawaiian Ti or Ti Plant)! Note: The above pictures of Ti Plants are just a few varieties that we’ve come across. 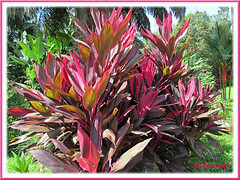 More photos of named varieties of Cordyline terminalis can be enjoyed at ForemostCo Inc Cordyline Collection. Have you seen it flowering! 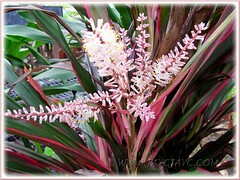 I have a photo of the pinkish one flowering, along with lots of flowers of Dracaena fragrans. Have never seen them flowering before, Andrea! Hope to visit you shortly to enjoy them. Do you have any pics of a white ti leaf plant? Haha…if we have that, nothing will prevent us from displaying here, Gwen! I came across this site because I was looking for more information about the ti plant I have that is just beginning to flower (early December 2011). You’re lucky to get to enjoy your flowering Ti Plant, Russ! Hope our plants will bloom for us one fine day.